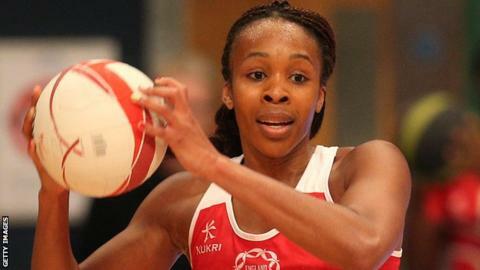 Captain Pamela Cookey made her return from injury to help England to a 70-25 win over Wales in the first game of the international series. Cookey, 30, suffered an Achilles injury in April which ruled her out of this summer's Commonwealth Games, where England finished fifth. But she completed 15 minutes in Liverpool as her side eased to victory. Wales were brought in to fulfil the first fixture of the tri-series after visa issues delayed Malawi's arrival. The African team are expected to arrive in time for Wednesday's game in London, before their final match in Worcester on Saturday. Wales are ranked eighth in the world, five places behind England, and failed to match the strength of Anna Mayes' side, which included Geva Mentor on her 100th international appearance. England led throughout after turning over Wales' opening centre and went in 15-7 ahead after the first quarter. Impressive shooting from Chelsea Lewis reduced the deficit to five but England hit back with 11 unanswered points to go in 33-12 ahead at the break. Mayes introduced wing attack Tamsin Greenway after half-time, who has returned to the England set-up after a two-year break, and she helped stretch her side's lead to 39 points. And goal attack Cookey was able to make an impact in the final quarter, scoring four times as England hit the 70-point mark.